A cutter and air crews deployed on Sunday afternoon. 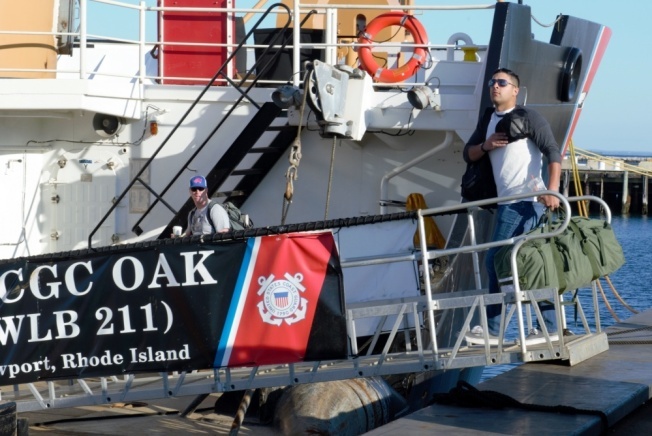 A Newport, Rhode Island Coast Guard cutter crew and three air crews from Coast Guard Air Station Cape Cod deployed in support of anticipated Hurricane Irma rescue and recovery operations on Sunday. The crew aboard Coast Guard Cutter Oak loaded the cutter’s buoy deck and cargo hold with nearly 137,000 pounds of aids-to-navigation gear including buoy chain, sinkers, and other hardware, which will be used after the storm to restore impacted waterways and facilitate the flow of maritime commerce. "We anticipate repairing and relocating damaged and detached buoys in the major shipping lanes,” said Cmdr. Mark Chrysler commanding officer of Coast Guard cutter Oak. He said the cutter will make an additional stop Monday at Coast Guard Base Portsmouth, Virginia, to load additional gear and supplies. On Saturday, Air Station Cape Cod deployed a HC-144 Ocean Sentry airplane and crew, and one MH-60 Jawhawk Helicopter with two crews aboard. They are currently pre-staged at the forward operating base at Air Station Elizabeth City, North Carolina, awaiting further orders in the event of mass rescue operations.